I have sold a property at 3436 19TH AVE W in Vancouver. SPECIAL! This is a Super Dunbar Family Home on a quiet tree lined street with peek-a-boo winter views of the water and city lights. Well kept by long term family owners. This home has a torch on roof and great layout. Three bedrooms on the main floor with Living, Dining, Kitchen and Eating area spilling out to a partially covered South facing deck. The master has a 3 piece en-suite and there are real Oak hardwood floors throughout. Downstairs is a family room and bedroom for the upstairs. There is a laundry room plus a one or two bedroom suite currently rented for $1250/mos. Walk-able neighborhood close to schools, shopping parks and transportation. UBC and downtown are easy to get to. Kitchener Elementary and Lord Byng High School Catchments. YOU'LL LOVE IT! Please visit our Open House at 206 1345 15TH AVE W in Vancouver. SUNRISE WEST This is an oversized one bedroom and one semi ensuite bath in a well established building in South Granville. This Northwest corner unit has big rooms, an open floor plan and high ceilings. The suite has a wood burning fireplace, a large balcony and lots of windows. Walk to shopping restaurants and theatres. Original condition awaiting your renovation and upgrade ideas. One parking and one storage locker. YOU'LL LOVE IT! Please visit our Open House at 3436 19TH AVE W in Vancouver. I have listed a new property at 3436 19TH AVE W in Vancouver. I have sold a property at 108 1266 13TH AVE W in Vancouver. I have listed a new property at 206 1345 15TH AVE W in Vancouver. VANCOUVER, B.C. 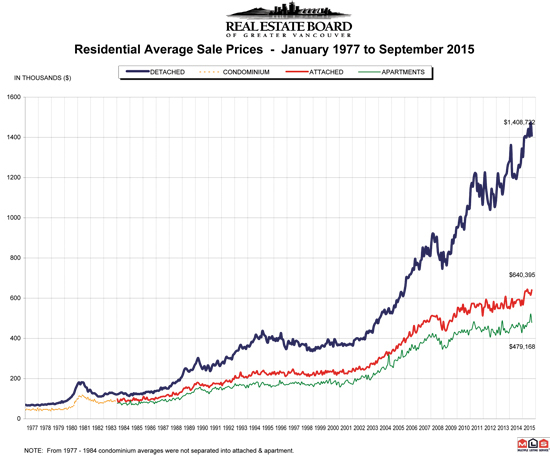 – October 2, 2015 – Conditions continue to favour home sellers across *Metro Vancouver’s housing market. The Real Estate Board of Greater Vancouver (REBGV) reports that residential property sales in Metro Vancouver reached 3,345 on the Multiple Listing Service® (MLS®) in September 2015. This represents a 14.5 percent increase compared to the 2,922 sales recorded in September 2014, and a 0.5 percent decrease compared to the 3,362 sales in August 2015. Last month’s sales were 32.9 percent above the 10-year sales average for the month. New listings for detached, attached and apartment properties in Metro Vancouver totalled 4,846 in September. This represents a 7.9 percent decline compared to the 5,259 new listings reported in September 2014. The total number of properties listed for sale on the real estate board’s MLS® is 10,805, a 27 percent decline compared to September 2014 and a 0.8 percent decline compared to August 2015. The MLS® Home Price Index composite benchmark price for all residential properties in Metro Vancouver is currently $722,300. This represents a 13.7 percent increase compared to September 2014. The sales-to-active-listings ratio in September was 31 per cent. Generally, analysts say that downward pressure on home prices occurs when the ratio declines below the 12 percent mark, while home prices often experience upward pressure when it reaches 20 percent, or higher, in a particular community for a sustained period of time. Sales of detached properties in September 2015 reached 1,272, an increase of 0.2 percent from the 1,270 detached sales recorded in September 2014, and a 24.3 percent increase from the 1,023 units sold in September 2013. The benchmark price for a detached property in Metro Vancouver increased 18.9 percent from September 2014 to $1,179,700. Sales of apartment properties reached 1,529 in September 2015, an increase of 28.7 percent compared to the 1,188 sales in September 2014, and an increase of 50.2 percent compared to the 1,018 sales in September 2013. The benchmark price of an apartment property increased nine percent from September 2014 to $415,100. Attached property sales in September 2015 totalled 544, an increase of 17.2 percent compared to the 464 sales in September 2014, and a 23.1 percent increase from the 442 attached properties sold in September 2013. The benchmark price of an attached unit increased 8.1 percent between September 2014 and 2015 to $518,600. I have sold a property at 101 888 13TH AVE W in Vancouver.